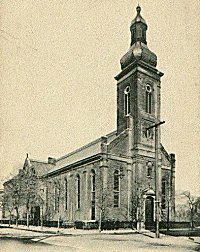 St. Benedict's (German) Roman Catholic Church was organized on June 28, 1857. The first missionary to the church was the Rev. Rupert Seidenbusch. The original church structure was made of wood and built in 1857. In 1859 it was destroyed by a hurricane and rebuilt in the same year. The brick church building was dedicated on July 11, 1882 by Bishop Wigger. The parish school was founded in 1858. NOTE: Includes individual indexes to baptisms and marriages. The marriage indexes are for groom only.